The popular Italian dessert tiramisu is typically composed of layers of sponge or ladyfingers, soaked in espresso liqueur; then layered with a mascarpone cheese and custard mixture; then dusted with cocoa or shaved chocolate (here’s the history of tiramisu). 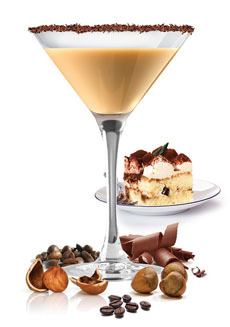 Those jonesing for a rich and creamy tiramisu dessert can now quickly mix up an easy Tiramisu Cocktail, with this recipe adapted from one from Frangelico. It seems especially festive for New Year’s Eve. Drink your tiramisu. Photo courtesy Frangelico. 1. Mix equal parts vanilla liqueur, vodka and Irish cream liqueur in a shaker with ice. Strain into a chilled Martini glass. 2. TOP with espresso and garnish with chocolate. Alternatively, before pouring the drink, set the chocolate shavings in a saucer to make a glass rimmer. Wet the rim 1/4 deep by dipping in a shallow bowl of water; then twist the glass in the shavings. 3. SERVE. Be prepared for refill requests. *We grate a chocolate bar with a Microplane grater. You can use whatever grater you have.